Continuous School Improvement Department coordinates Differentiated Supports, Accountability & Recognition for designated schools under the District's ESEA Waiver. Want to know more? Click these One-Pagers below to learn more. Click on name of school to go to OUSD Public Data Folder, courtesy of the District's www.ousddata.org website. What is the common strategy of supports for Priority Schools? Priority schools are paired with a higher performing school within the C.O.R.E. Districts to engage in knowledge sharing, professional collaboration, site visits, and other learning activities throughout the year. This includes attending an annual Pairing Institute in the fall with other CORE districts. What is the common strategy of supports for Focus Schools? Focus schools are placed within a small Community of Practice with schools within the same district that are focused on similar areas of improvement (Problem of Practice). These schools engaged in ongoing collaboration, dialog, and professional learning. This includes attending an annual Communities of Practice Institute in the fall with other CORE districts. What is the common strategy of supports for Other Support Schools? AMO schools are placed within a small Community of Practice with schools within the same district that are focused on similar areas of improvement (Problem of Practice). These schools engaged in ongoing collaboration, dialog, and professional learning. This includes attending an annual Communities of Practice Institute in the fall with other CORE districts. Click HERE to download a list of the 2015-16 Facilitators for each school. 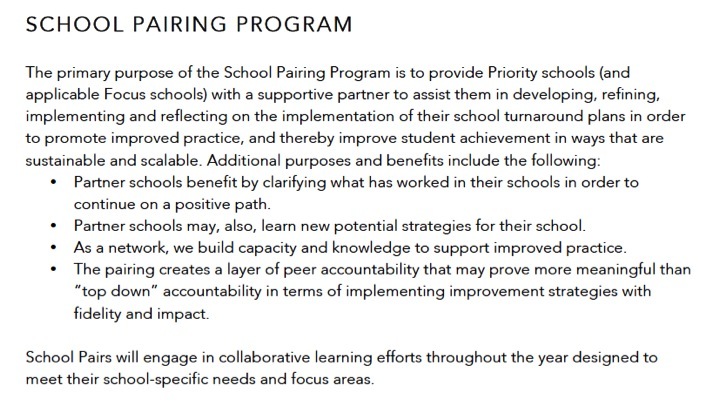 Priority schools are assigned a Facilitator that coordinates participation in Pairing activities. Facilitators are the Network or Deputy Superintendents. Focus schools are assigned a Facilitator that coordinates participation in Community of Practice activities. Facilitators are the Network or Deputy Superintendents. AMO schools are assigned a Facilitator that coordinates participation in local Community of Practice activities. Facilitators are the Network or Deputy Superintendents. Click HERE to download tools and resources to support the Pairing Program. Click HERE for C.O.R.E. tools and resources to support the Communities of Practice Program. California Office to Reform Education is a non-profit organization responsible for coordinating and facilitating the 7 ESEA Waiver districts in CA. The ESEA Waiver establishes that participating districts will use a new system for measuring school quality. The indicators of quality in that system are listed below. Some metrics are still in development. Introduction to the School Quality Improvement Index. (S) Schools that have recently received the Federal School Improvement Grant (SIG) are automatically designated as Priority Schools. * AMO Schools (Annual Measurable Outcomes) are additional schools designated under the ESEA Waiver to receive specific supports based on performance, having not met Adequate Yearly Progress for two years, as defined under Federal law. * NOTE: FOCUS SCHOOLS: It is possible that the Problem of Practice selected by the Focus School in their Community of Practice may not be directly related to the underperforming student group that resulted in the Focus School designation, but is nonetheless a priority area of continuous improvement.